Our newest and most comprehensive EMV test card set for the U.S. market. This card set includes Visa, Mastercard, Amex, Discover, U.S. Debit and Interac Debit cards featuring a variety of Cardholder Verification Methods. 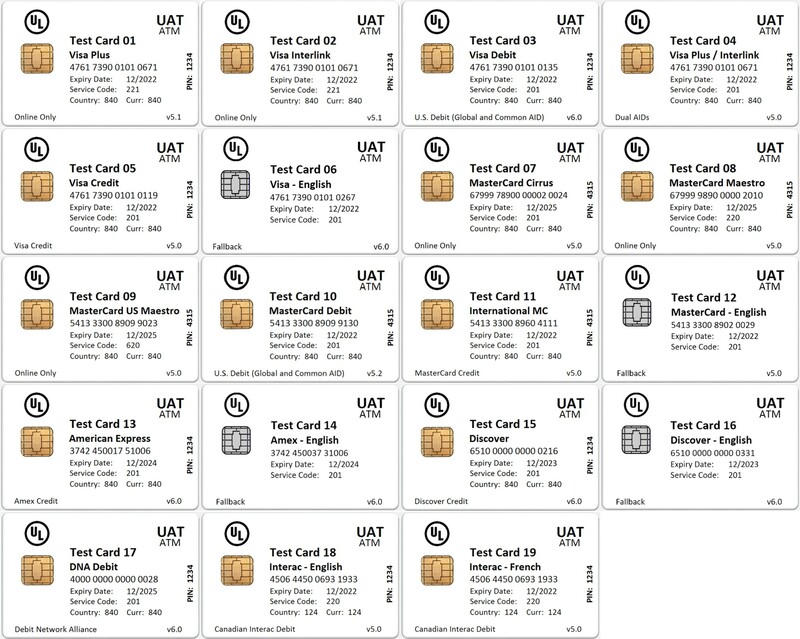 The UL UAT USA card set is intended for customers that require EMV contact, contactless and fallback cards for development, testing, training, or demonstration purposes. Note: This card set is recommended by some processors for User Acceptance Testing. 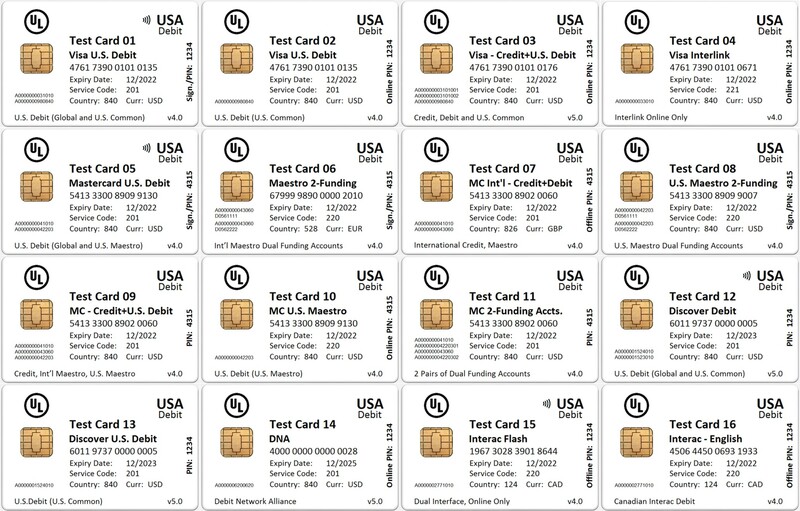 Designed specifically for the U.S. market, this set of 21 EMV test cards is ideally suited for User Acceptance Testing (application development and testing), training support personnel and performing demonstrations. All cards are English-language and contain both a chip and a magstripe. Individual cards noted as “Dual Interface” operate in both EMV contact and EMV contactless modes. The Mastercard dual interface cards support both contactless EMV and contactless MSD. The Visa, Amex and Discover dual interface cards support contactless EMV only and do not support contactless MSD. Note: Card images (below) may not reflect current card definitions. Please refer to product documentation for details. Designed specifically for the U.S. market, this comprehensive EMV Debit card set contains cards personalized to match the many U.S. Common Debit scenarios that must be supported by EMV devices deployed in the USA. The UL USA Debit card set contains both U.S. Common Debit cards (Discover, DNA, Mastercard and Visa) and Canadian Interac debit cards. The U.S. Debit cards contain both Global AIDs and U.S. Common Debit AIDs, referencing both Single Funding Account and Multiple Funding Accounts. Four cards are EMV Dual Interface (contact / contactless) cards and all cards contain a contact EMV chip and a magstripe. Note: This card set includes a comprehensive U.S. Debit Test Plan with over 150 test cases to help you understand and test the many U.S. Debit scenarios that should be supported by EMV solutions deployed in the USA. Note: Many processors outside of Canada do not yet support the Interac Flash BIN ‘196730’ in Test Card 15. If not supported, the card should be accepted by the POS but will not obtain a host approval. Please contact your acquirer account representative to determine if the Interac Flash BIN range is supported on their development host. Designed specifically for use by companies in the ATM market. The UL UAT ATM card set includes credit and debit cards supported by ATMs such as Visa Interlink, Visa Plus, Mastercard Cirrus, Interac and a variety of other Visa, Mastercard, Amex, Discover and DNA cards. All cards contain a contact EMV chip and a magstripe. These cards are contact only and do not have a contactless interface. 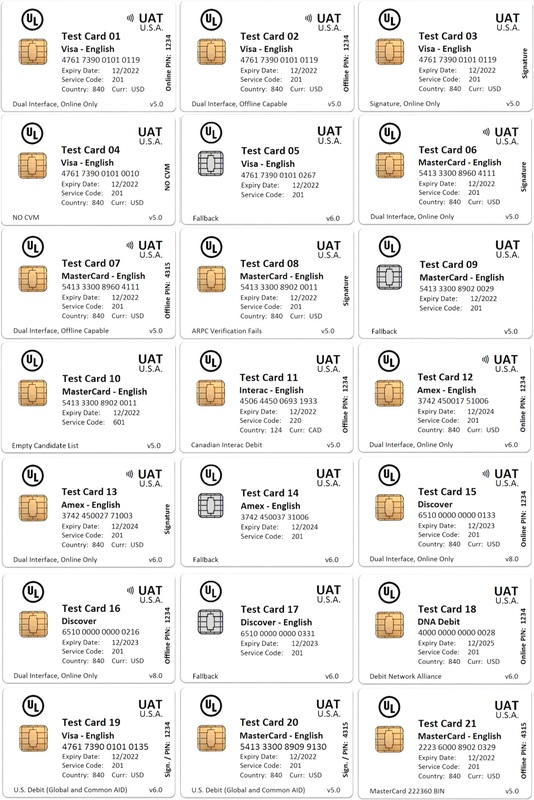 esigned specifically for the ATM market, this set of 19 EMV test cards is ideally suited for User Acceptance Testing (application development and testing), training support personnel and performing demonstrations. All cards contain a contact EMV chip and a magstripe. These cards do not have a contactless interface. All cards are “Online Only” and require an Online PIN. 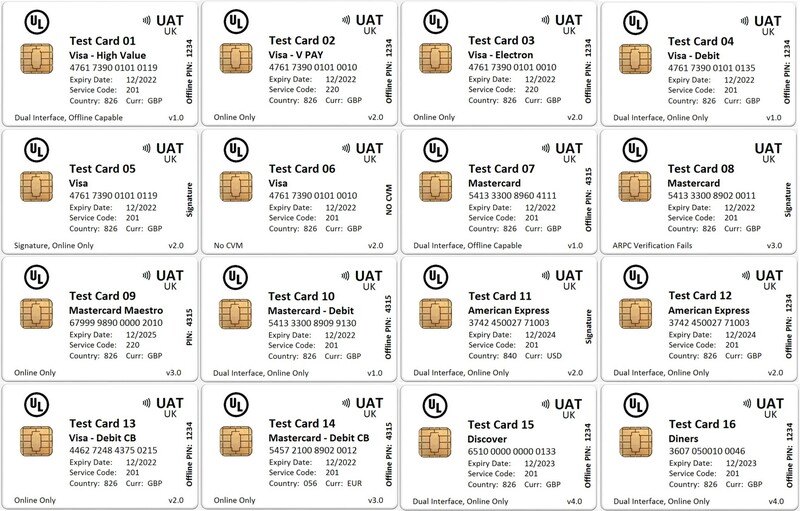 Designed specifically for the U.K. market, this set of 16 EMV test cards is ideally suited for User Acceptance Testing (application development and testing), training support personnel and performing demonstrations. Designed specifically for the U.K. market this EMV card set is ideally suited for performing User Acceptance Testing, training and demonstrations. This card set consists of Amex, Diners, Discover, Mastercard and Visa cards with primarily U.K. Country and Currency Codes. All cards are English language and contain a contact EMV chip and a magstripe. Most cards also include a EMV contactless interface. Designed specifically for the European market, this set of 16 EMV test cards is ideally suited for User Acceptance Testing (application development and testing), training support personnel and performing demonstrations. This card set includes cards issued from multiple countries with several different currencies. Some cards support multiple languages and all cards contain both a chip and a magstripe. Individual cards denoted as “Dual Interface” also support EMV contactless. The Mastercard dual interface cards support both contactless EMV and contactless MSD. The Visa and Amex dual interface cards support contactless EMV only, they do not support contactless MSD. Our newest and most comprehensive EMV test card set for the Canadian market. This card set includes Visa, MasterCard, Amex, Discover and Interac Debit cards featuring a variety of Cardholder Verification Methods. The UL UAT Canada card set is intended for customers that are deploying solutions in Canada or want to ensure their system can process Canadian EMV cards. It is ideal for customers that require EMV contact, contactless and fallback cards for development, testing, training or demonstration purposes. 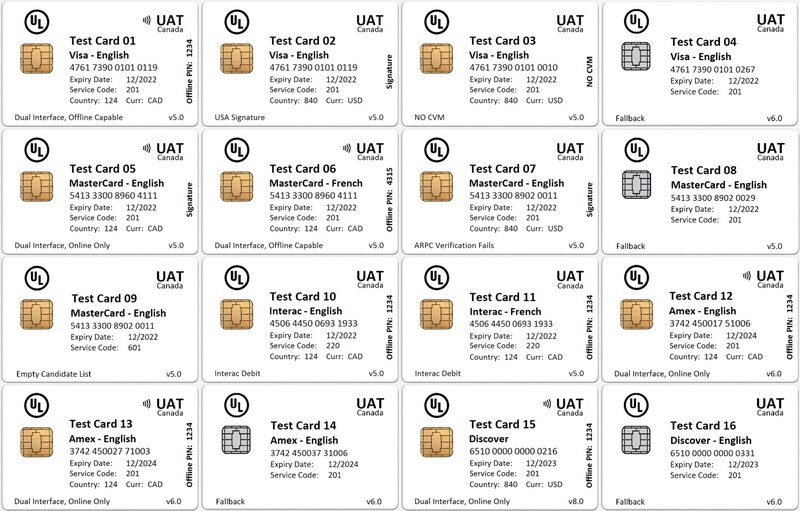 Designed specifically for the Canadian market, this set of 16 EMV test cards is ideally suited for User Acceptance Testing (application development and testing), training support personnel and performing demonstrations. The set contains both Canadian and U.S. cards and all cards contain a magstripe. Individual cards denoted as “Dual Interface” operate in both EMV contact and EMV contactless modes. The Mastercard dual interface cards support both contactless EMV and contactless MSD. The Visa dual interface cards support contactless EMV only - they do not support contactless MSD. Designed specifically for the U.S. market, this 3-card set contains cards personalized to match the various configurations of Interac cards issued in Canada. Designed specifically for the U.S. market, this 3-card set contains cards personalized to match the various configurations of Interac cards issued in Canada. Two of the cards include the Interac application as well as a global payment brand (aka co-badged debit and credit cards). The U.S. payment industry is attempting to provide guidance to U.S. merchants to help prevent transaction processing issues related to incorrect AID selection for Canadian issued cards, causing interoperability issues resulting in a poor cardholder experience. Using the UL Interac USA Interop EMV Test Card Set you can test your EMV solution to ensure it processes Canadian issued cards properly before it is deployed. The set is relevant to merchants who support Interac as well as merchants who do not and want to ensure their EMV solution correctly selects the global payment brand application. Contains two eftpos debit / Mastercard EMV cards that can be used to ensure that your POS solution supports eftpos Multi-network cards. The set contains both a contact only and a dual interface EMV test card. Designed for companies deploying EMV solutions supporting Interac Flash EMV debit. Individual cards denoted as “Dual Interface” support EMV contact and EMV contactless. Note: Many processors outside of Canada do not yet support the Interac Flash BIN ‘196730’ used for these cards. If not supported, the cards should be accepted by the POS but will not obtain a host approval. Please contact your acquirer account representative to determine if the Interac Flash BIN range is supported on their development host. This set is intended to help merchants determine if their contactless readers support magstripe-grade contactless-only products or validate they have properly disabled contactless MSD support. This card set includes one Visa and one Mastercard Dual Interface contact/contactless Magstripe only cards, that do not include EMV contactless support. Both cards support MSD contactless only and will fail when the POS device only supports EMV contactless. An economical card set designed for developers, testers and trainers who only require a few simple EMV credit cards to test and demonstrate basic EMV contact, contactless and fallback functionality. Note: For customers who require a more comprehensive EMV test card set, the UAT-USA or UAT-Canada card set would likely be a better choice. An EMV test card set containing both EMV contact only and EMV dual interface cards intended for simple testing, training and demonstrations where a more comprehensive EMV test card set is not required. Individual cards denoted as “Dual Interface” operate in both EMV contact and EMV contactless modes. The Mastercard dual interface cards support both contactless EMV and contactless MSD. The Visa dual interface cards support contactless EMV only, they do not support contactless MSD. Two Mastercard BIN ‘2’ EMV cards that can be used to ensure your POS solution supports the new Mastercard ‘2xxxxx’ BIN range. The set contains both a contact and a contactless EMV test card. Both cards contain a magstripe for fallback processing. This set contains two Mastercard BIN ‘2’ EMV cards that can be used to ensure your POS solution supports the new Mastercard ‘2xxxxx’ BIN range. The set contains both a contact only and a dual interface EMV test card. Both cards contain a magstripe for fallback processing. The dual interface card has both contact and contactless interfaces. The contactless interface supports both contactless EMV and contactless MSD. An extension to the B2 USA EMV Test Card Set that includes EMV contact /contactless Amex and Discover cards. All cards contain a magstripe for fallback processing. This card set is intended for customers who have previously purchased the B2 USA EMV Test Card Set and wish to extend their existing EMV card set(s) to include Amex and Discover cards. This set of six test cards supplements the B2 USA EMV Test Card Set (see above) by adding Amex and Discover cards. All cards are English-language, have a USA Issuer Country Code, a USD Currency Code and contain both a chip and a magstripe. Individual cards noted as “Dual Interface” operate in EMV contact and EMV contactless modes. This card set expires 12/2023. An extension to the B2 USA EMV Test Card Set that includes EMV contact Visa, Mastercard and Debit Network Alliance EMV U.S. Debit cards. The Visa and Mastercard cards each contain two AIDS linked to a single funding account. A U.S. Common Debit AID and a Global Debit AID. This card set is intended for customers who have purchased the B2 USA EMV Test Card Set previously and wish to extend their existing EMV card set(s) to include EMV U.S. Debit cards. This set of three test cards supplements the B2 USA EMV Test Card Set by adding a selection of U.S. debit cards. All cards are English-language, have a USA Issuer Country Code and a USD Currency Code. All cards are contact only and contain both a chip and a magstripe. Note: For a more extensive U.S. Debit EMV card set, please review the UL USA Debit EMV Test Card Set which includes a U.S. debit test plan and cards with multi-funding accounts and multiple AIDs that allow you to test many more of the complex U.S. debit scenarios that should be supported when deploying EMV solutions in the U.S. marketplace. A Dual Interface contact / contactless EMV test card set containing a number of Visa and Mastercard Online-Only, Online-Preferring and Offline-Preferring cards intended for EMV contactless processing. All cards contain a magstripe for fallback processing. Note: The Mastercard cards also support MSD contactless. The Visa cards do not support MSD contactless. This set of Dual Interface (DI) – Contact & Contactless – cards allow you to demonstrate and test EMV contact and contactless transactions. All cards are English-language, have a USA Issuer Country Code and a USD Currency Code. All cards contain both a Dual Interface chip and a magstripe. The Mastercard dual interface cards support both contactless EMV and contactless MSD. The Visa dual interface cards support contactless EMV only, they do not support contactless MSD. 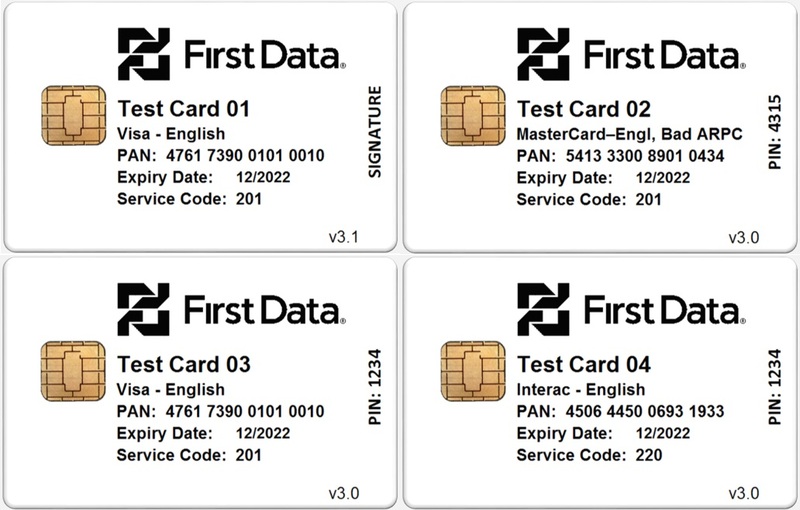 An EMV contact and fallback card set designed specifically for First Data™. This set includes Visa, Mastercard and Interac cards intended for companies that wish to run transactions against the First Data host. This EMV contact only card set includes cards with Canadian and U.S. Issuer Country and Currency Codes and is suitable for use in both the U.S. and Canadian markets. This EMV test card set is ideally suited for training store support personnel, generating EMV test transactions and performing demonstrations. The cards are English-language and include both USA and Canadian Issuer Country / Currency Codes. All cards are contact only and contain both a chip and a magstripe. An EMV contactless card set containing Visa and Mastercard Online-Only EMV cards intended for use with the First Data™ host. All cards support EMV contactless, contact and fallback transactions. Note: The Mastercard card also supports MSD contactless. The Visa card does not support MSD contactless. This set of Dual Interface (DI) – Contact & Contactless – cards allow you to demonstrate and test EMV contact, contactless and fallback transactions. All cards are English-language, have a USA Issuer Country Code, have a USD Currency Code and contain both a Dual Interface chip and a magstripe. The Mastercard card supports both EMV contactless and MSD contactless. The Visa card does not support MSD contactless. A U.S. debit card set intended to validate that your EMV solution can process U.S. Common Debit transactions. This card set contains one Visa and one U.S. Maestro card. Both cards contain a single U.S. Common Debit AID. This is a legacy single AID card set that no longer reflects any of the EMV debit cards being issued in the U.S. Therefore, this set has been discontinued and instead we recommend purchasing the B2 USA Debit EMV Test Card Set (3 cards). That set features updated multi-AID U.S. debit cards and includes an additional DNA debit card. This set of EMV debit cards allows you to test and demonstrate contact U.S. Common Debit EMV transactions. All cards are English-language and contain a single U.S. Common Debit AID. This card set expires 01/2022. Designed in co-operation with First Data™, each card in this Dynamic Currency Conversion (DCC) EMV test card set has a different Currency Code, allowing merchants to test cards with a wide variety of non-USD currencies. Note: Effective May 2018 Card 03 and Card 04 have been upgraded to be DCC Dual AID cards identical to the two cards in the First Data DCC Dual AID EMV Test Card Set. An extension to the First Data™ Dynamic Currency Conversion (DCC) EMV test card set for merchants who wish to test additional currencies. This supplementary set of Dynamic Currency Conversion (DCC) cards extends the First Data DCC EMV card set by adding cards with additional currencies. This card set is intended for generating EMV DCC test transactions, training store support personnel and performing demonstrations. 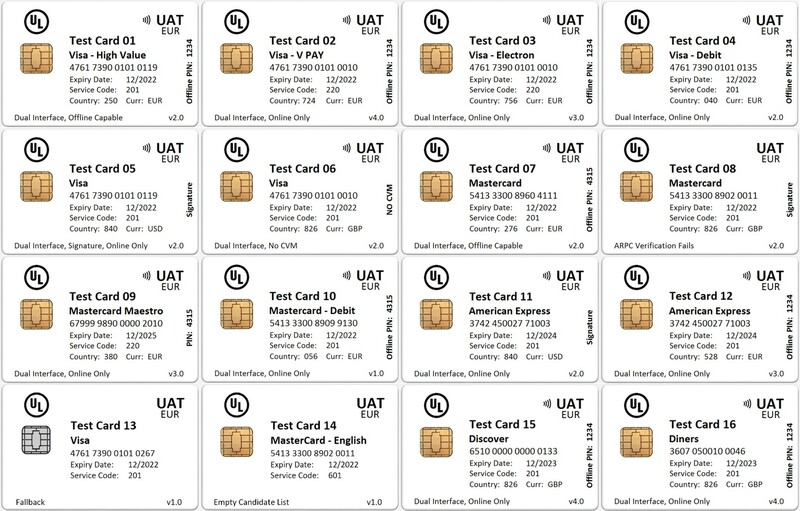 These cards can be used for First Data DCC User Acceptance Testing (UAT). All cards are contact only and contain both a chip and a magstripe. An extension to the First Data™ Dynamic Currency Conversion (DCC) EMV Test Card Set that includes DCC EMV cards with two AIDs. This card set is intended for customers who purchased the First Data DCC EMV Test Card Set prior to May 2018 and wish to add these new DCC Dual AID cards to their set. Note: Effective May 2018, Card 03 and Card 04 in the First Data DCC EMV Test Card Set were updated to be Dual AID cards, identical to the two cards in this card set. If you are purchasing the First Data DCC EMV Test Card Set, you do not need to purchase this card set as well. The Europe card set was specifically designed for Adyen to perform User Acceptance Testing (application development and testing), train support personnel and perform demonstrations within the European marketplace. The set includes credit/debit cards with a variety of Language Codes, Country Codes and Currency Codes. All cards are “Dual Interface”, support EMV contact/contactless and have a chip and a magstripe. The North America card set was specifically designed for Adyen to perform User Acceptance Testing (application development and testing), train support personnel and perform demonstrations within the North American marketplace. This set includes English credit/debit cards with a variety of Currency Codes and Country Codes. The Clearent test card set contains two EMV cards intended for use when performing User Acceptance Testing of your EMV solution connecting to the Clearent host. Each card contains a chip and a magstripe. Each card is denoted as “Dual Interface” and operates in both EMV contact and EMV contactless modes. These cards were customized to Clearent’s specifications and is a subset of EMV cards from the UL UAT USA card set. Note: the Clearent card numbers don’t necessarily match those of the UL UAT USA set. This set card set expires 12/2022. 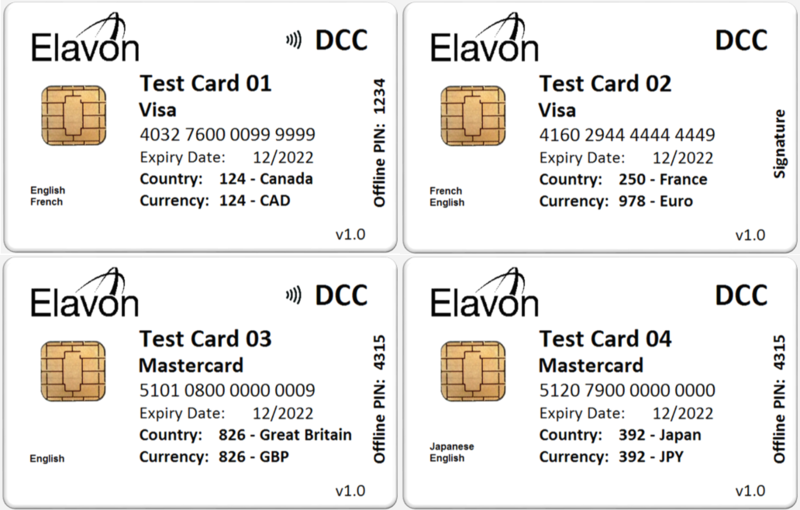 The Elavon Dynamic Currency Conversion (DCC) test card set contains EMV cards intended for merchants that support Elavon DCC transactions. Individual cards denoted as “Dual Interface” operate in both EMV contact and EMV contactless modes. This set of three EMV cards was designed specifically for Global Payments to assist VARs and Systems Integrators perform User Acceptance Testing (application development and testing), train support personnel and perform demonstrations. All cards are Dual Interface (contact/contactless), have a chip and a magstripe. Cards have been personalized with a Canadian Country Code and Currency Code. 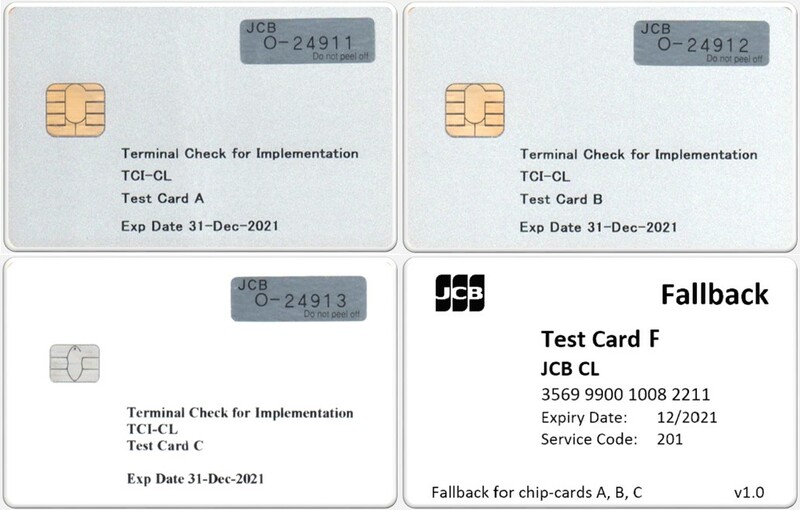 The JCB Acquirer Dual Interface test card set consists of three Dual Interface JCB EMV cards and one magstripe-only card for fallback processing. Cards A and B are a combination of Japan, JPY, Japanese/English languages and Card C is a Taiwan, TWD, Chinese/English languages card. This card set expires 12/2021. For acquirers performing UnionPay Certification Tests which require cards with PAN falling into BIN range 81xxxx. The UnionPay BIN 81 test card set consists of three Dual Interface cards and three magstripe-only cards, all of which have PANs beginning with '81'. All cards have different PANs and contain a magnetic stripe. NOTE: By design, the magnetic stripe for Test Card FT28/QPC21 is not encoded (contains no data). All EMV cards have an Issuer Country Code of 156 (China), a currency of 156 (Chinese Yuan Renminbi) and are Chinese language. This card set expires 10/2030. 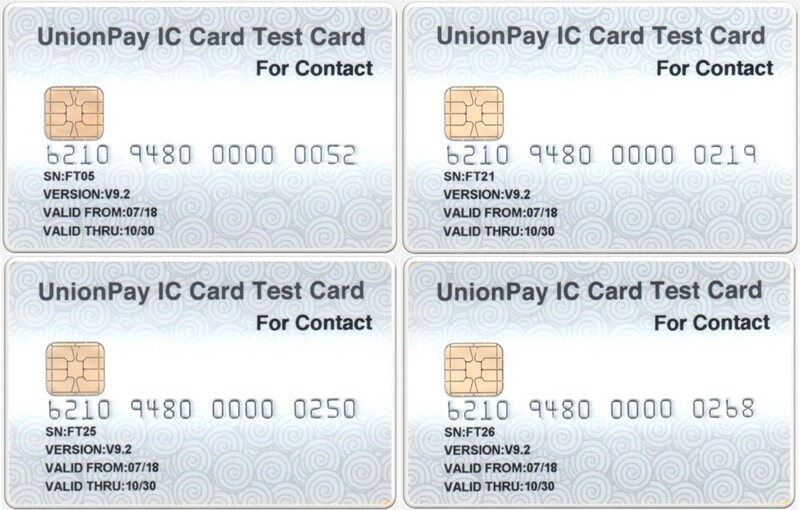 The UnionPay test card set consists of four Contact Only UnionPay EMV cards. All cards have different PANs and contain a magnetic stripe for fallback processing. The cards are a combination of Chinese and Chinese/English language cards. 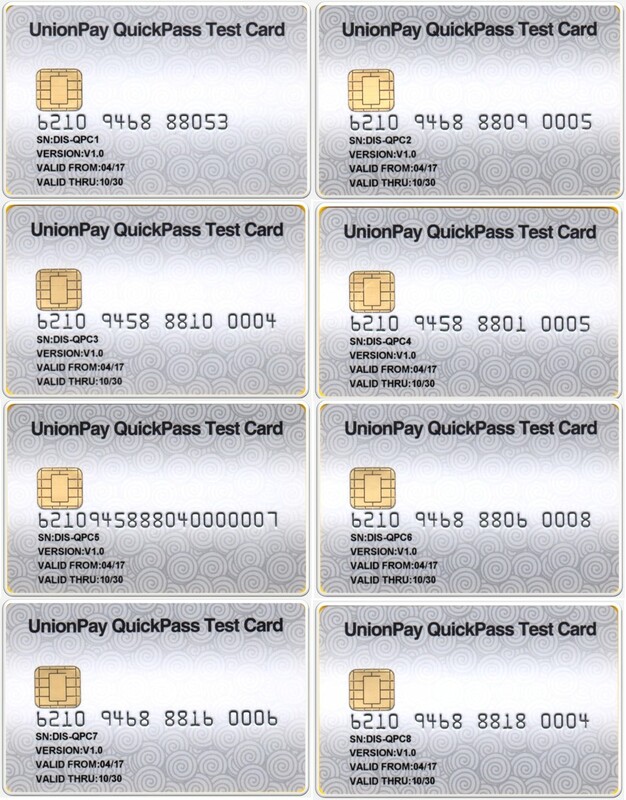 The UnionPay QuickPass Test Card Set consists of eight Dual Interface UnionPay EMV cards. For acquirers performing UnionPay International's Acquiring Certification Test for accepting UnionPay QuickPass cards by POS (Point of Sale). A mixture of UICS Credit and UICS Debit cards with different PANs, including those with length of 13 and 19 digits. All have issuer country code indicating China and language of Chinese. There are cards with currency of USD and others with CNY. All contain a magnetic stripe for fallback processing. This card set is designed for use when performing User Acceptance Testing of a Worldpay Integrated Payment Client (IPC) solution. The card set contains four EMV contact and contactless cards. 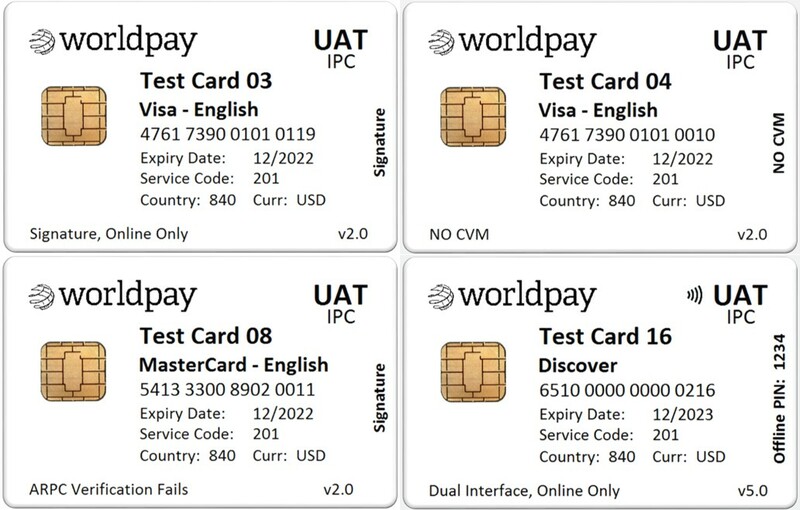 The Worldpay Integrated Payments Client test card set contains four EMV cards intended for use when performing User Acceptance Testing of your EMV solution connecting to the Worldpay host. Each card contains a chip and a magstripe. If a card is denoted as “Dual Interface” it operates in both EMV contact and EMV contactless modes. This card was customized to Worldpay's specifications and is a subset of EMV cards from the UL UAT-USA card set. Therefore, the card numbers are not consecutive.